When you search the internet, scour social media and review your textbooks, there are thousands of fine motor activities available to improve children’s fine motor skills. It can become completely overwhelming just to decide what activity to choose to help a specific child. It is important to understand the components of school-related fine motor skills. Just because there is a multitude of fine motor activities available for improving children’s fine motor skills in general, it doesn’t mean one size fits all. Certain fine motor activities are more suited to developing essential skills for school tasks such as handwriting. 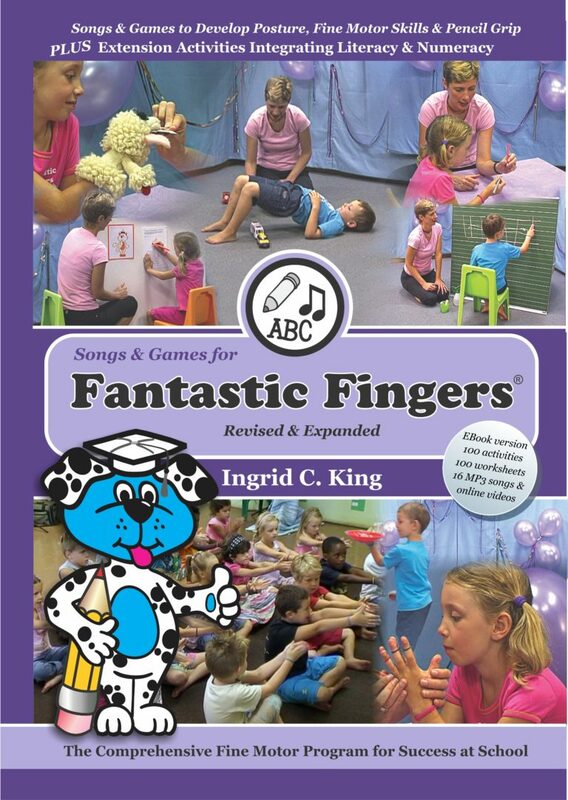 Ingrid S. King, MScOT, BOT, has created the Fantastic Fingers® Fine Motor Program which includes songs, games and extension activities specifically selected to achieve this purpose. BONUS: Download a FREE hand out at the bottom of this post explaining why children needed to strengthen their muscles in order to write successfully. These three main components are the essential foundation upon which good fine motor manipulative and representational skills are built. When this foundation is not well consolidated, children struggle to perform fine motor tasks. “Mr. Muscles” is the strength component of fine motor skills in the Fantastic Fingers® Fine Motor Program. In order for a child to perform a fine motor task with good coordination, the child first needs to have sufficient muscle strength in the relevant muscle groups and use the correct movement patterns. In order to hold and write with a pencil, the child firstly needs a good upright seated posture to position their arms and hands optimally. This means that the muscles in their neck and trunk (stomach and back) must be strong. A child with weak neck and/or trunk muscles may lean heavily on the table or support their head in one hand. It is hard to write for any length of time when most of the child’s energy goes into just trying to sit up! Secondly, the muscles within their shoulder girdle (shoulder blade and collarbone region), arm and hand need to be strong. In addition, the way their forearm, wrist, and fingers are positioned and moved is also important. Shoulder stability is the ability to contract (pull together) the muscles on either side of the shoulder girdle to hold the upper arm steady. This allows the arm to be held in different positions while the forearm and hand do an activity like writing. Shoulder control refers to the ability of the muscles on either side of the shoulder joint to relax gradually on one side while contracting on the other side. This allows the arm to move in a controlled and accurate way. Shoulder stability and control are important as they enable the child to place and hold their arms and hands in a good position for writing and other fine motor tasks. Forearm position for writing is pronated (turned) so that the palm faces partially down. This helps to position the wrist back for writing. Two muscles in the forearm need to be strong to keep the forearm pronated. Wrist strength is important for keeping the wrist extended (held in a slightly bent back position) during pencil tasks. This bent back position helps to position the thumb, pointer and middle fingertips close together allowing for better control. Thumb and pointer finger control the pencil with small bending and stretching movements at the finger joints. Sufficient finger strength is important. The middle finger supports the pencil from the side and also moves somewhat. Kinaesthesia is the so-called ‘sixth sense’, telling the child where their body parts are positioned in space as well as the force and extent of their movements. The brain receives incoming information from receptors in their joints and muscles. Kinaesthesia is an internal body sense and does not involve vision. The tripod pencil grip allows the child to clearly see their pencil tip. It is important for younger children, whose sense of kinaesthesia is still developing, to be able to watch their pencil tip when forming letters. pressure, and light touch as well as pain and temperature. The ability to smoothly and evenly touch the tip of the thumb to the tip of each finger within the same hand has been found to be a significant predictor of handwriting ability (Berninger & Rutberg, 1992). and skin of the hand will contribute to correct pencil grip and pressure, and also well controlled movement of the writing tool. Isolated finger movements occur when one finger (or parts of the finger) moves independently from the other fingers. Isolated finger movements are required for tasks like pointing, counting on one’s fingers and touch typing. Refined finger movements are the small, precise movements of the thumb, pointer and middle fingers which occur during pencil tasks. For most children the tripod pencil grip places their first three fingers in the best position for optimal refined finger movements. 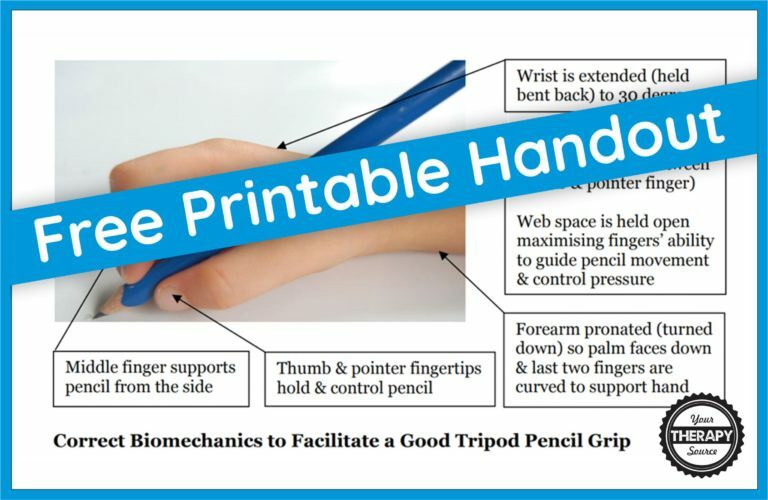 Good refined finger movements together with efficient sensory processing (including the visual system) leads to good pencil control and an accurate, tidy end product. In-hand manipulation refers to the skilful repositioning of an object within the hand after it has been grasped. In-hand manipulation skills have been found to be a good predictor of handwriting ability (Cornhill & Case-Smith, 1996). This is because the pencil is manipulated several ways when writing: adjusting the pencil within the hand after picking it up and gripping it correctly before writing; subtly shifting the position of the fingers on the pencil shaft when writing; and sometimes rotating the pencil to use the eraser end. Mature in-hand manipulation skills allow for the pencil to be used with good control. 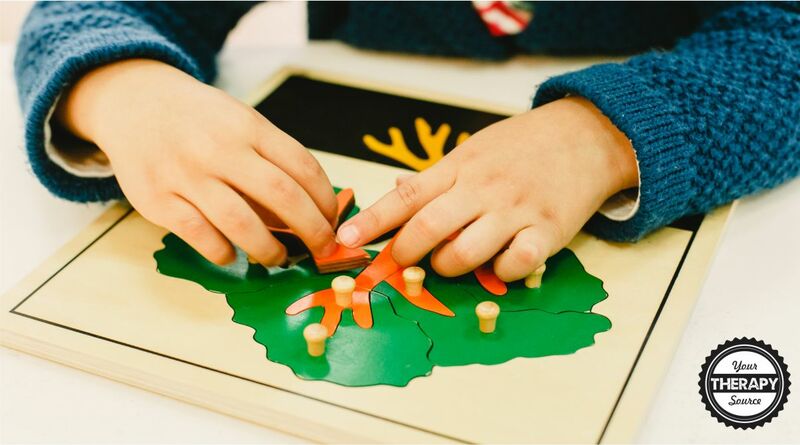 The knowledge component (“My Mind”) refers to the cogntiive component that the child requires in order to do the fine motor task more efficiently and successfully. This requires the adult’s teaching input and the child’s attention and interest. Sign up to receive the Your Therapy Source weekly email and announcements and you will be redirected to the download. If you are already a subscriber, just enter your email again. You will not receive duplicate emails. Thank you! 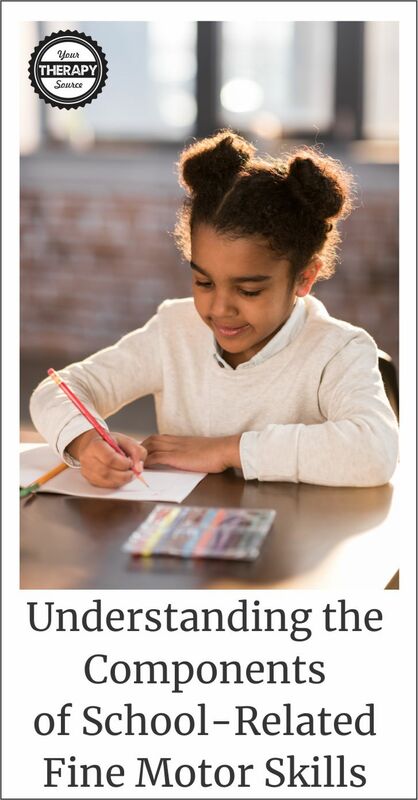 How do you assess if a child is making progress in foundational skill areas to support handwriting performance? How do you determine if further intervention is required? 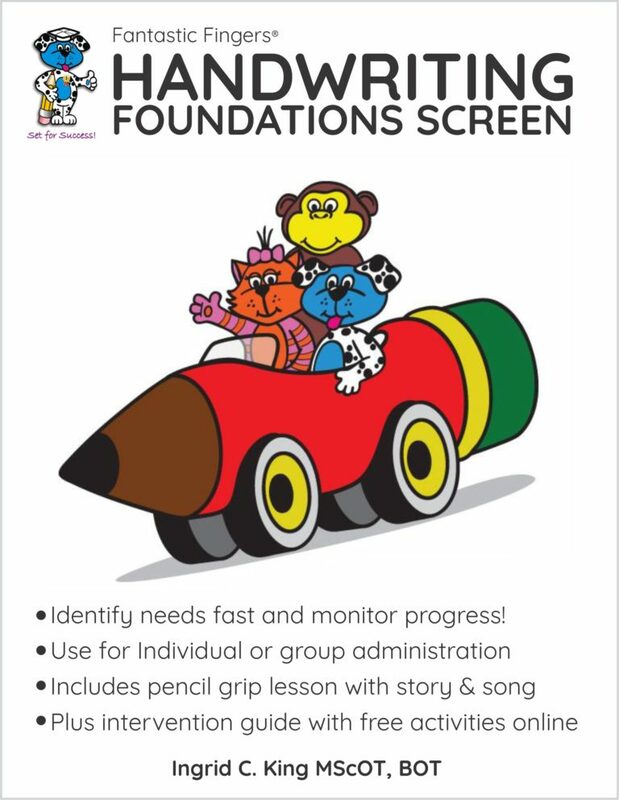 Ingrid S. King MScOT, BOT developed the Fantastic Fingers ® Handwriting Foundations Screen to identify handwriting needs fast and monitor progress. Fantastic Fingers® Fine Motor Program is a comprehensive fine motor program that includes ebook, music, and instructional videos. It’s user-friendly, research-based, and improves children’s fine motor skills, pencil grip, posture and more. It also integrates many early literacy and numeracy skills.